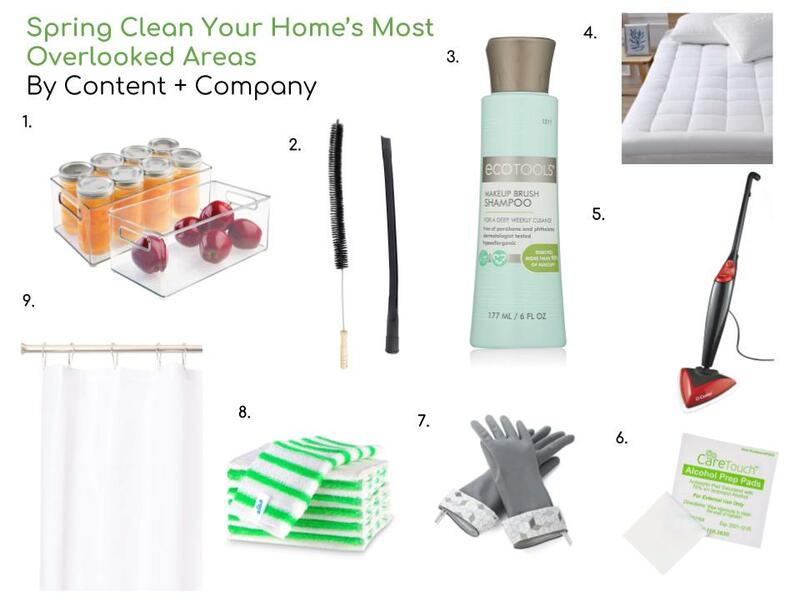 LIFE AT CONTENT: Spring Clean Your Home's Most Overlooked Areas — CONTENT + CO.
99% of the year, I handle the house cleaning here at Content. That includes all the daily cleaning, tidying up after John and I, and our many businesses run from the house. Plus, all the cleaning associated with our Airbnb guests. With over 3,500 square feet of living space and guests coming and going, by default, I’ve become somewhat of a cleaning professional. But, even with all that time vacuuming, moping and dusting, once a year, I hire actual professionals to give Content a thorough spring cleaning. Making sure to cast a bright light on all the nooks and crannies over looked during the winter months. I’m sure you’ve experienced this phenomenon before: You stare at something long enough and you start to ignore the imperfections. Same goes with cleaning spaces over and over. By hiring a crew, I make sure we find every cobweb and evict every, last dust bunny! While preparing for this year’s spring cleaning, I started thinking about all the things within our homes that get overlooked when it comes to cleaning. For instance, when was the last time you disinfected your makeup brushes or your cell phone? Here’s a list of some of our favorite cleaning products and techniques, for some of your home’s most overlooked areas. One of the easiest ways to keep your refrigerator clean, is to keep it organized! We love these clear plastic bins for just about everything in the fridge. Imagine cutting your cleaning time by taking out a few bins, as opposed to dozens of bottles and jars. Bonus: It makes inventorying your fridge even easier! The laundry room is the work horse of any house! But simply cleaning the lint trap/filter of your dryer may not be enough, especially if you’re dryer isn’t performing correctly. This handy Dryer Vent Cleaning Kit includes a flexible, bristle wand and vacuum attachment. Check out this great instructional video about cleaning your dryer. Bonus: Your dryer will run better and decrease drying times! When was the last time you cleaned your makeup brushes or sponges? Experts recommend doing so once a month. To keep myself on schedule, I keep this Makeup Brush Cleaning Shampoo by Ecotools right in my makeup bag which not only cleans but also conditions makeup brushes. Bonus: You’ll increase the longevity of your favorite brushes with a vegan, 100% cruelty free, and PETA certified product! When you purchased your mattress, you likely researched comfort and longevity. The simplest way to keep your mattress feeling brand new is with a quality mattress pad. And if you can’t remember the last time you purchased one, chances are it’s time for an upgrade. Do yourself a favor and elevate your cleaning game with a steam mop - We love our steam mop by O-Cedar. I use it on almost every floor in Content including our hardwood and tile shower floors (see your floors manufacturer’s instructions). The steam is so hot it kills gems and bacteria, without the use of harsh chemicals - just hot water! The pads are reusable and washing machine safe. Bonus: No more lugging around a mop and bucket; this unit only weighs 5 lbs! What goes with you everywhere, even the bathroom, and hardly ever gets cleaned? Your cell phone. Gross, right? I keep a stash of sterile alcohol prep pads in my bag and a few in the car. When I’m sitting in traffic or waiting for an appointment, I kill time by disinfecting my cell phone. Take off the case and wipe everything down. Bonus: Don’t forget to wipe down your earbuds and Bluetooth, too! Make sure to protect yourself from all the germs and bacteria you’re busy getting rid of. I’ve had a pair of these awesome Cleaning and Dish Gloves for about a year. They’re a step up in the function and style department from your grandmother’s yellow rubber gloves. Their unique cuff design catches water from rolling down your arm and the inside is lined with a soft fabric, so you’re hands don’t get clammy. Bonus: They have hanging loops so you can hang and store them between uses. We’ve made a conscience effort to reduce our paper towel consumption and these reusable Bamboo Microfiber clothes were a great substitute. We use them daily, wiping down the sink in our kitchen and bathrooms, and on surfaces throughout the house. Shower curtains take a daily beating from water and soap build-up, not to mention mildew. Replace your plastic liner with a fabric shower curtain liner, and keep it fresh by tossing it in the washing machine every few weeks. Have a suggestion? What other areas of your home are overlooked? Comment below! Looking for other ways to prepare for spring? Check out Spring Finds Under $30.